Dr. Sajja received her medical degree from Stanley Medical College in Madras, India. She completed her internship at the University of Medicine and Dentistry at St. Mary’s Hospital in Hoboken, New Jersey, and her residency with the Methodist Hospital (Houston) Family Medicine Residency Program. She is board certified in family medicine and sees newborns and older. Dr. Sajja decided to become a doctor at an early age after seeing how doctors were able to greatly improve the quality of life for her sister, who was born with a congenital heart problem. She sees herself as a friendly, caring health advocate for her patients and believes in involving them in their disease management to improve compliance and outcomes. Among the many conditions she treats, Dr. Sajja’s special interests are in preventive medicine for children, diabetes and weight management for adults and children. In her free time, Dr. Sajja enjoys gardening, cooking and singing. Dr. Sajja practices at Memorial Hermann Medical Group Katy Convenient Care Center in West Houston. Learn more about Dr. Prasuna Sajja. 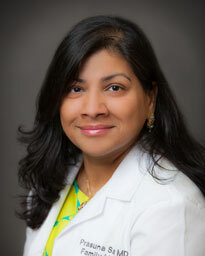 Family medicine physician, Prasuna Sajja, M.D., has joined Memorial Hermann Katy Convenient Care Center. Family medicine physician, Prasuna Sajja, M.D., has joined Memorial Hermann Katy Convenient Care Center. Dr. Sajja received her medical degree from Stanley Medical College in Madras, India.